Lesson one: don’t mess with a grue, for you are crunchy and taste good with ketchup. Yep. Bad. Fear the strange furries. Haha! You got a lot of faith in Hack! I love it! I WAS wondering about how Fluffy already seems to have blood in its mount. Well, that would depend on what Fluffy actually is. I’d take a look at what Hack says on page 8 of this chapter for some observations to draw conclusions from. Soo.. The little Tasmanian devil is some sort of revenant? A vengeful ghost? 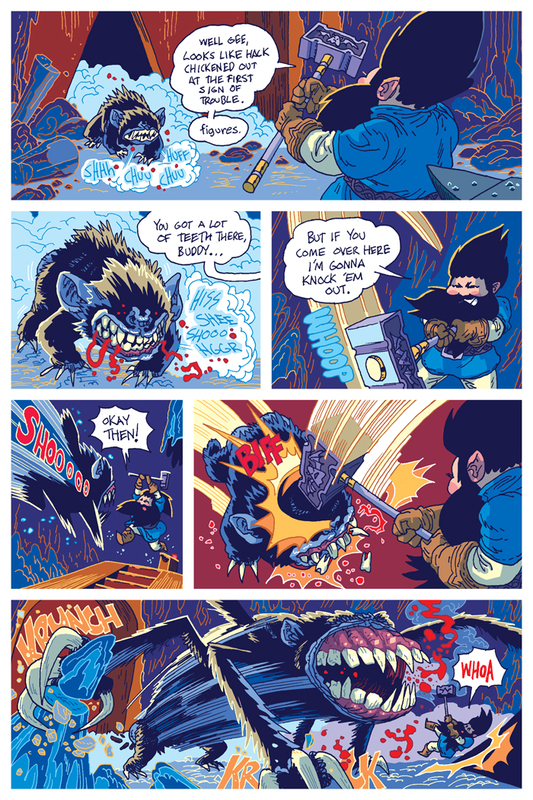 Hm, yes; having binge read the comic up to this point, I can say with certainty as an Unofficial Official Dwarfologist (by which I mean I’ve played and failed at Dwarf Fortress numerous times) that this comic is 100% accurate to all things Dorf. Also the humor, world, and art are simply delightful. Also, Fluffy seems to have a mean case of Batface.